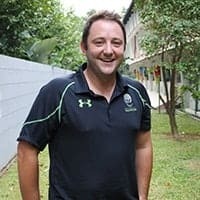 Outside of the classroom I am member of the Singapore Rugby Union Referees Society and the Hong Kong Society of Rugby Union Referees, try and compete in the occasional triathlon or ocean race, and enjoy cooking a BBQ! I have been teaching at ISS International School since 2001. 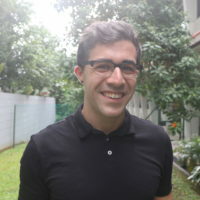 Originally from France, I taught English for the French Ministry of Education and French as a foreign language in various UK and Australian Schools and Universities. Always linking the study of foreign languages and theatre, I was in charge of the cultural activities at the French Institute of Scotland in the 80’s in Edinburgh and served as Deputy Director of Alliance Française in both Sydney and Singapore in the 90’s. I have always had a passion for Musical Theatre, which is shared today with my Drama students and the school community through theatre appreciation outings and full-scale productions. I attended my latest professional development workshop in New York in 2014 where I was fully trained and accredited as part of the MTI Broadway Teachers international team to develop musical theatre education and projects in secondary schools. I love to walk, wander, and wonder. I love looking, learning about the world, making art, travel, reading, and my 4 sons who are busy making their way in the world. To feel the fabric of a place I always visit the Art Gallery and the fresh food market. Teaching Art and Design internationally has been a great adventure and a privilege. I started out as a designer for a number of years and then became a teacher. Teaching all students how to think creatively for innovation is a passion of mine. It is the difference students can make in the world. 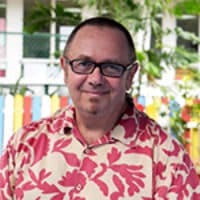 I have been teaching senior and middle school students in Austria and China for the last 4 years and before that as Head of Design Art & Technology Canberra Grammar School for 14 years. Prior to that I lectured at Universities in both Melbourne and Canberra in art, design, and education. I’m French-Colombian. I grew–up surrounded by teachers in my family; I pursued a BA in Government and International Relations and I was awarded a scholarship to do part of my studies in France. After that, I went back to Colombia to start my first job as High School Teacher in Social Sciences back in 2005. While teaching at international schools, I was also volunteering to give workshops to teenagers in the sensitive areas of the city. Later on, I got a scholarship from the Spanish Government to study for a Master’s degree in Constitutional Law and Political Sciences. I did another master’s degree in International Development Cooperation. Through those years in Madrid I was working as a Spanish and English teacher for companies during the day and at night I was a student. Later I moved to France where I continued teaching Spanish and English to diverse student profiles, I worked as a translator and helped to set up business between French and Spanish startups. After we moved to Singapore, I have been teaching Languages at two international schools and ended a Master degree in Education. This experience has been more than enriching, it has been a fun adventure. I strive to generate motivation and confidence in my students but also help them be aware of Global Social Issues and the impact that as citizens of the world we can have to lead change. I am really looking forward to the new academic year. And apart from teaching what I like to do is to travel, dance salsa, hike in nature and read. 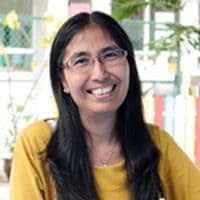 I’m Serene Chin, a Chinese born in Malaysia but raised and bred in Singapore. After post graduation, I taught at the Ekamai International School in Bangkok for two years. 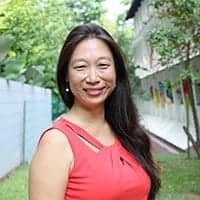 Following a short stint at the Singapore Korean School, I joined the ISS community in 1999 and have been teaching Language B English in the Middle School ever since. I believe second-language learners need to be supported emotionally and be in an environment where they can make mistakes and speak up freely. Despite being busy with school, motherhood, family and my dogs, I try to spend the remaining time with my church community, mostly supporting and planning activities for the children, playing the piano and participating in the church choir. Currently, I’m learning to play the church organ. Visiting the sick and elderly are also part of my routine. Perhaps the most challenging experience I have had was climbing Mount Kinabalu in Sabah twice. I started teaching Mandarin to international students at Peking University. That was in the early 1990s when China was just opening up and people were fascinated by its history, culture and big market opportunities. When I moved to Singapore, I taught exchange students at Nanyang Technological University, and I realised that I really enjoyed teaching and meeting people from different parts of the world. Working for the IB as a Team Leader of DP Examiners, Workshop Leader and School Visit Team Member has reinforced this excitement. At ISS International School, I like to see my students happily making friends, challenging themselves and enjoying their learning. It is fulfilling to see them growing up. 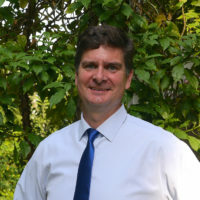 Since beginning teaching in England in 1991, I have been fortunate to have the experiences of working in international schools in Vietnam, Portugal, the Netherlands, and Denmark. These experiences have given me the opportunities to work with colleagues and students from differing backgrounds, with differing abilities in certain areas, and with differing talents. These constant challenges have ensured that I have maintained my enthusiasm for teaching, and my sense of humour! Most importantly, I realise that there is more to teaching than simply delivering content. I recognise the importance of making learning relevant, using real examples, and creating an enthusiasm within the class to always ask ‘why?’ I encourage students to find answers, suggest reasons, and generate solutions. I first studied journalism and finished my Bachelors in Warsaw, Poland, where I was able to travel and see a lot of Europe. I have been teaching Physical Education since 2006 in the USA and Taiwan. My goal as a PE teacher is to instill a love of movement and life-long learning in all my students. I want the students to have the confidence and knowledge to engage in any activity they want at anytime in their life. I enjoy being outside doing many different activities, from running and cycling, to exploring and seeing the local art and culture of wherever I am. I am excited to join Middle School Science. 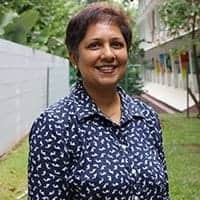 With more than ten years international teaching experience in Australia, United Kingdom and Singapore, I value ISS International School’s impressive reputation for providing an inclusive, nurturing and empowering education – a vision I strongly believe in. My background in Middle School Science using a variety of curriculum frameworks has allowed me to develop a flexible and holistic approach to teaching. I actively try to inspire, nurture and empower students to believe in themselves, realise their potential and become active global citizens who value mutual respect, internationalism, leadership, experiences and service. I am keen to make a difference within our Middle School community at ISS International School. I am originally from Myanmar, but grew up in Paris and have lived abroad most of my life. Being in an international community is where I feel the most at home. 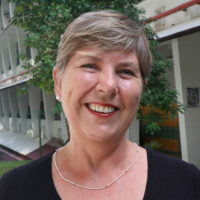 I arrived in Singapore in 2005 and have been teaching at ISS International School ever since. 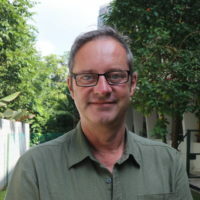 Prior to this, I taught at the International School of Yangon (ISY) in Myanmar; at Ecole Active Bilingue (EAB) a bilingual international school in Paris; and at the Alliance Francaise de Yangon. Over the years in my teaching career I have taught several subjects including English for Academic Purposes focusing on the topics of Science and Individuals & Societies in High School. 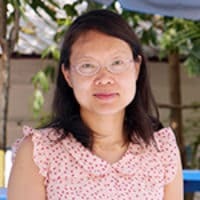 In MYP I have focused on Language B: English and French as well as ESL Science and ESL Individuals & Societies, Physical Science and Social Studies. I also taught French to a team of neurosurgeons from UPSA laboratory’s Pain Clinic, set up at Yangon General Hospital. I have studied Biology at the University of Santa Thomas and attended the TEFLE course at the British Institute in Paris. There is nothing quite like teaching. Each learner, each class, each day is unique. I have been fortunate to have had the opportunity to work in a wide spectrum of educational settings. I began my career In Mumbai, India, as a Primary school teacher. Exploring other avenues, I worked with teams, producing English texts for Primary schools and interactive content for teachers to use in Government schools. 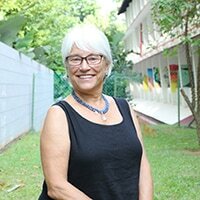 The move to Singapore provided the opportunity to work in international schools and to teach the PYP curriculum. In schools, and in workshops I’ve attended, I have been fortunate to collaborate with wonderful educators and gain fresh perspectives on teaching and learning. Once home, I de-stress by walking my retrievers, maintaining my plants and reading. My family love to travel and we try to find places, off the beaten track. 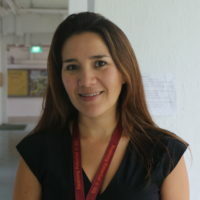 Born and raised in Singapore, I began teaching right after graduating from NUS in the Singapore school system. Shortly after, I got married and began the adventure of living overseas with my husband and 3 kids. Saudi Arabia, Portugal, various states in USA, Australia, Shanghai-China and Singapore are some places that I have lived. My life has been enriched by the many cultures I have experienced, as well as the many wonderful friends I have met along the way. I am also more appreciative of the wonders of languages as being able to speak Malay and Mandarin has helped me significantly overseas. I started substitute teaching when I came back to Singapore. The interaction with the students, each with their own unique background and personality, is what I truly enjoy about teaching. I have taught a myriad of subjects and grade levels, but my primary interest has been in Math and Design. As a true Singaporean, I can cite eating as a hobby. As such, I enjoy cooking and baking as well as doing home improvement projects. 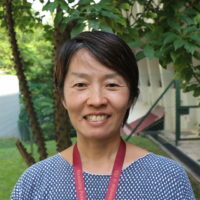 I have 10+ years of experience in teaching English to Japanese children in Tokyo, Japan. I have taught children in kindergarten and students in elementary and middle schools. 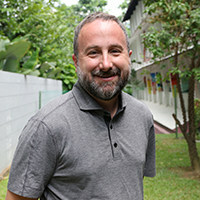 I am now very excited to be able to continue on with my teaching career as a part of the ISS community here in Singapore. I’ve always had a passion for education, as I believe that education is the key factor in peace-building and making a better world for the future generations. I love to help students develop their intercultural understandings and respect for each other in a multilingual and multicultural environment. Born and raised in Tokyo, I have spent 2 years in WA, USA, as a college student. After going back to Japan, I became a freelance interpreter/translator and mainly worked in the sports division of a public TV station, before taking up my second career as an English teacher. I am a mother of 4 children, and I love traveling and enjoy outdoor/marine activities such as swimming, snorkelling, camping and trail hiking. Having grown up in the UK and been lucky enough to work in some elite sporting environments my passion was always to move into Physical Education teaching. Being able to provide students with the necessary tools and information to live an active and sporting life is key passion of mine, and something that I cherished whilst I was at school. My philosophy is very much based around keeping students active, making teaching period purposeful as well as enjoyable and safe. 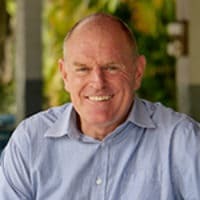 I have taught in Australia and Singapore and coached rugby at an elite level in the UK. I enjoy playing touch football, golf and squash as well as embracing the South East Asian culture… especially the food! After nearly 25 years in snowy New England, I migrated east to sandy Dubai where I began my international teaching career and truly found my calling as a music educator. Prior to teaching, I worked as a professional bass player. This is something I still remain active with today, performing and recording whenever possible across a variety of musical genres. My continued passion for music models the idea of lifelong learning which I try to instill in all of my students. Music is often regarded as a universal language, which, within the international school environment, allows all students the opportunity to develop skills as communicators and inquiring individuals, regardless of their native or fluent languages. 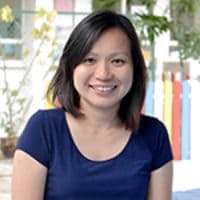 Being an educator for 11 years in Singapore, I had the opportunity to work with different groups of children ranging from toddlers to elementary school students. When I am working with my students, I enjoy helping them to reach for their dreams and potential. With my interest in art and dance, I love sharing these aspects of my Chinese culture with everyone I am working with as we live in a diverse society where every should learn to child feel valued and treated with respect. 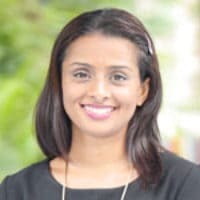 It is an exciting new journey for me to join ISS International School where I would be able to build on my learning journey as an educator in one of the most established international school in Singapore. 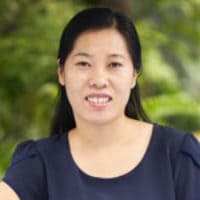 My teaching career began in 1997 after graduating from Yanbian University. I have taught courses like Intensive Chinese, Chinese Listening, Speaking and Writing for students from different countries in the universities for more than ten years in China. 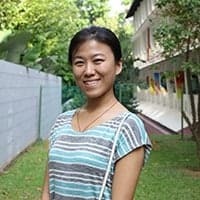 I moved to Singapore in 2013 and have taught for 3 years as an elementary school Mandarin teacher and Bilingual Class Teacher at Eton House International School. Teaching Chinese at IB school has inspired and motivated me to explore more about IB teaching and learning. I am excited to join ISS International School and to be a part of the school community. My teaching philosophy always encourages me to keep on improving myself to meet students’ needs. 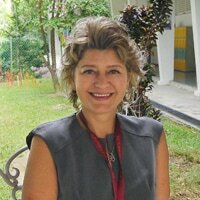 I am originally from Turkey and have been living in Singapore since 1994. I have a vast experience on third culture kids who live in different countries throughout their education lives due to the expatriate life requirements. My interest in education and students well being derives from curiosity and hunger that I have felt, to make them achieve their best potential and to provide them a conducive environment to do so. I believe every student has equal chance and right for education, no matter what the difficulties they are facing. 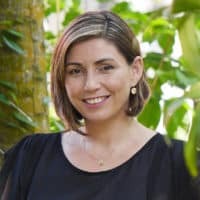 I have years of experience working with children and adolescents with special needs and my lifetime goal is to reach out to those who have difficulties and help them along the way by providing a support with a holistic approach that they rightfully need. I have 2 wonderful teenagers who are continuously helping me to be the best I can. I am a second career teacher, and only started teaching after 16 years in the Chemical Industry. I re-discovered my passion for education when my family moved to China when I started studying Mandarin. Since then, I have taught at international schools in Shanghai, China for the last 9 years and completed my Masters in Math Education. I have taught at both the high school and middle school levels and enjoy the challenges and rewards of teaching and inspiring children to become confident learners. One of my goals is to help students enjoy math and science as much as I do. I have moved to Singapore with my wife’s career and am thrilled to join the ISS community. I have 2 children, a son and a daughter, both of whom are back in the US attending university. In addition to loving math and science, I also enjoy running, cycling, reading, and games of all sorts. 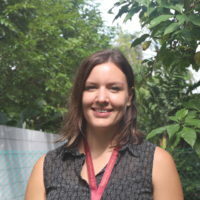 I am originally from the US, but have spent the last three years as a Learning Support Teacher at an international school in Dubai. It is there where I found my passion for teaching and working with young global citizens. I aim to encourage all students to become confident inquirers through the development of literacy and research skills. Having been a lifelong lover of literature myself, I’m eager to assist students at ISS as they discover their own interests in reading, and to nurture their curiosity for the world around them through time spent in the library. My teaching career began with languages and travel. I directed US-USSR programs: CIEE’s College Exchange, Children’s Art Exchange, and Citizen Exchange Council educational trips. As a learning specialist in Vermont, I coordinated services with therapists, speech language pathologists, and neurologists. Wanderlust brought me to Asia, and years in Shanghai deepened my resolve to engage students with diverse challenges in inclusive environments. Discovering meditation through tragedy (widowed and losing a son), I am grateful for life’s gifts. One son is an engineer, married to a Russian dancer; the other is a commercial beekeeper in Hawaii, married to a teacher. Joy is winter holidays with grandchildren in Hawaii and summers together on our Vermont farm. Cyclist, swimmer, kayaker, skier, Pilates enthusiast, and dancer, I believe in the transformative power of wellness to help us achieve our best. An optimist, I consider myself a teacher diplomat, and am honored to work at ISS.